(From left to right) Zachary Thatcher, Nathan Martin, Rheanna Ward, Governor Dannel P. Malloy, Alexander Reardon, Alexandra Merkouriou, Nicholas Poulos, Steven Onorato, Dr. Bryan Huey, Terry Ng. 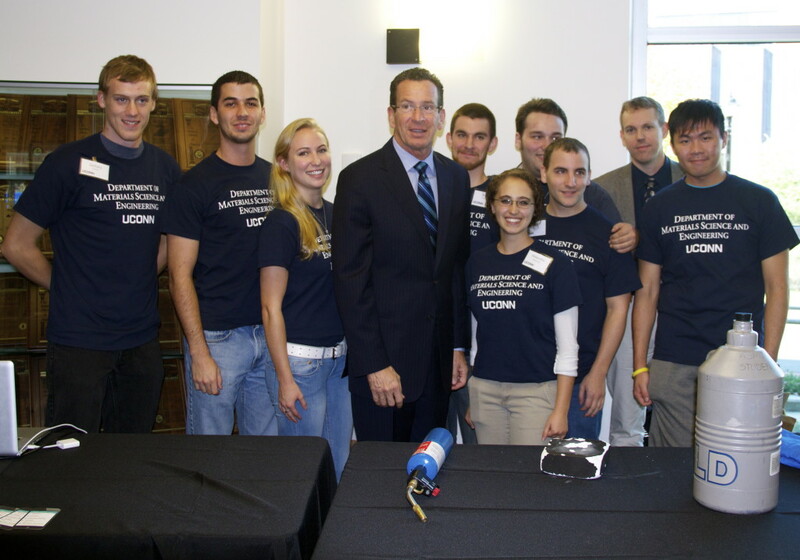 On October 21, Governor Malloy visited UConn’s Storrs campus to celebrate the final approval of Next Generation Connecticut legislation. Approved by both the state legislature and Malloy this past June, the plan involves a total commitment of $1.77 billion, including $1.54 billion from the state, to expand innovation, research, and educational opportunities in the science, technology, math, and engineering (STEM) fields at UConn over the span of the next decade. Goals of the initiative include the hiring of 259 new faculty members, of which 200 will be in the STEM disciplines, enrollment of an additional 6,580 undergraduate students, and construction of new STEM facilities and laboratories on the Storrs, Greater Hartford, and Stamford campuses. The plan is expected to attract $270 million in research dollars, $527 million in new business activity, support 4,050 permanent jobs, and increase the number of STEM graduates by 47%. “Somebody had to think about the future of Connecticut,” Malloy commented on the legislation. One of the most ambitious state investments in innovation, research, and education in the nation, Next Generation will create historic economic and educational growth for the university and the state of Connecticut, positioning UConn as a leading research institution and reinvigorating the state economy through technological innovation. 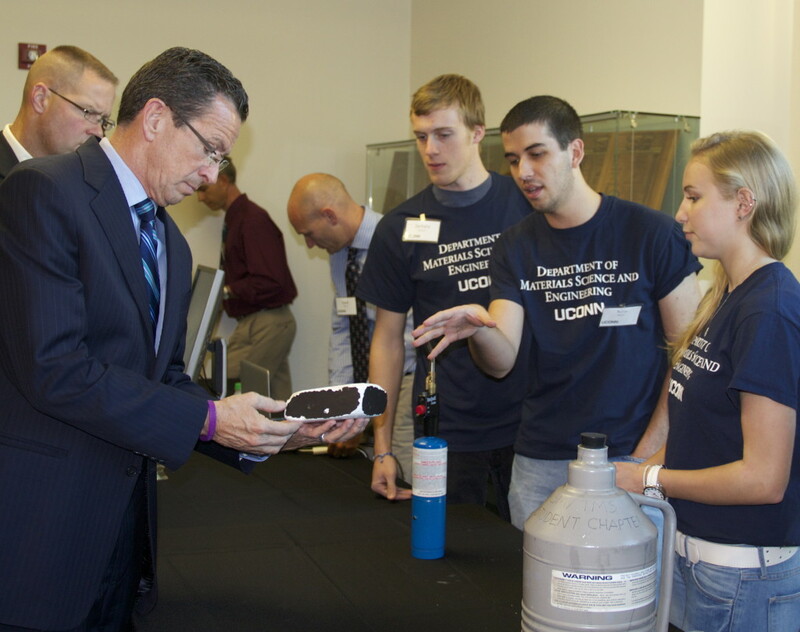 (From right to left) Rheanna Ward, Nathan Martin, Zachary Thatcher, showing Governor Dannel P. Malloy a ceramic foam space shuttle tile. The ceremonial bill signing and press conference were held in the Information Technologies (ITE) Building. Also in attendance were state legislators, UConn President Susan Herbst, and various members of the engineering community. Engineering professors conducted virtual reality demonstrations for Governor Malloy following the ceremony. Department of Materials Science and Engineering (MSE) students were excited to meet Malloy and conducted experiments in magnetic levitation using ceramic superconductors produced in MSE undergraduate labs.